Soma Massacre: Anger Sweeps Turkey - Down with the Government of Murderers and Thieves! 274 miners have been declared dead and up to a hundred are still trapped underground after an explosion in a Turkish coal mine in the western town of Soma. The accident reveals the ruthless exploitation and extreme inequality behind the economic growth of the past decade. All of Turkey is in mourning as the images of hundreds of deceased miners being carried out of the mine shafts are broadcast across the country. Rescuers worked through the night while hundreds had gathered outside the shaft, some crying uncontrollably, some kneeling and sobbing and others just staring in disbelief. As one of the survivors was carried onto an ambulance he humbly asked whether he should take his shoes off or not. The accident seems to have been triggered by a faulty transformer which exploded, thus cutting electricity cables so the power supply failed, shutting down the vital ventilation system. Due to the lack of electricity, lights and lifts in the mine could not work either making the rescue efforts even harder. The explosion also started a fire which further aggravated the situation. Throughout the day rescue workers were pumping oxygen into the shafts. But freshly exposed coal tends to absorb oxygen - a fact that leaves little hope for the remaining miners who are trapped in the mine. The spread of toxic gasses from the fire also delayed rescue operations. The explosion hit the mine as workers were preparing for a shift change, raising the casualty toll because there were more miners inside the mine than usual. On Wednesday morning, 18 hours after the explosion the fire was still bazing inside the mine. This is the worst mining accident that Turkey has every experienced. Recep Tayyib ErdoganPrime Minister Receb Tayyip Erdogan has cancelled all his prior engagements and called for a 3 day mourning period. However, his hypocrisy is clear to all Turks. Only two weeks ago the AKP rejected a motion put forward by the opposition Republican People's Party (CHP) to the Turkish parliament to investigate work related accidents in the mines in Soma. Speaking in parliament on 29 April an opposition MP from the right-wing republican MHP party said that 5,000 work accidents took place in the Soma region in 2013. 90 percent of these were in the mines. Most of these were burns, but the hospitals in the area do not have the necessary burn units. Workers die an average of 8.5 times more in Turkey than in the European Union. There were 880,000 occupational accidents between 2002 and 2013, and 13,442 were killed in these accidents. In 2002, 872 workers were killed in occupational accidents, while this number was 1,235 workers in 2013. The ruling AKP rejected these figures with one of its MPs claiming the mines in Soma were the safest in the country. However, he also stated, that accidents do occur due to the “nature of the profession”. On this basis the resolution of the CHP was rejected in parliament on April 29 April. "This is not something that suddenly happened. I can tell you that there are people here who are dying, people who are injured and it's all because of money. People are dying and there's nothing we can do about it. They send us here like lambs to the slaughter. We are not safe doing this job." Other workers claimed that the real death figures were much higher because the number of casual workers working in the mines was not revealed. The mine in Soma was privatised in 2005 and sold off to a close ally of the ruling AKP. Besides any indirect connections, the wife of Soma’s General Manager Ramazan Doğru's, Melike Doğru, was herself elected as an AK Party member of the Soma Municipal Council. This was reflected in a recent interview with Alp Gürkan, the owner of the Aegean conglomerate Soma Holding, with Hürriyet. He boasted about how his company managed to reduce the cost of mining coal from $130-140 to $23.8 per ton “thanks to the operational methods of the private sector,”. Soma Holding, is one of Turkey's biggest coal producers with 5.5 million tons of annual production. In the above mentioned interview, Gürkan said the company had started to grow particularly after the Turkish government’s decision to change the way royalties were calculated. It is clear that the miners who are dying today are paying the price for the privatisation programmes of the AKP. Amongst the victims is Kemal Yıldız, a 15 years old boy. Recent regulations in education introduced by the ruling AKP government opened the way for child labour. The minimum working age was brought down to 14 years, and 16 years for heavy industries. According to a report by the İstanbul Worker Health and Work Safety Council, at least 1,203 workers died in “work accidents” in Turkey, of whom 55 were children. However Erdogan has not been very apologetic. Coming out of an election victory, the increasingly undemocratic Prime Minister seems to think of himself as invincible. His arrogance has been glaring during this tragedy. Erdogan vowed that the government would investigate the accident thoroughly, but emphasized that the Soma mine, in contrast to many others, was one of the safest in Turkey. Showing a complete disregard for the lives of the workers - as if he were talking about breaking a tool - he also added: "Let's not interpret the incident as one that won't happen in coal mines. These things happen." Here we see the real attitude of the capitalists who only see the workers as just another tool which can break, but which is easily replaceable. For them the workers are nothing but aggregates to the machines in the mines and factories. However, they seem to forget that while they themselves play no productive role whatsoever, it is the working class which produces the wealth and runs society. Without the workers not a single lightbulb would shine! In reality it is the capitalists who can be disposed of without any negative consequences on society. The actions of the AKP are proving this very point to the whole of Turkish society. Riot police and gendarmes surrounded Erdogan in SomaThe accident in the mine and the arrogant attempt by the AKP government to cover up for their capitalist friends, has led to outrage across Turkey. Protesters gathered spontaneously across the country to denounce the cynical attitude of Soma Holding and the AKP. Protests in IstanbulAll day yesterday the the hashtag #kazadegilcinayet, which translates as "murder not an accident" was trending on Twitter. In Istanbul riot police closed off the area around Gezi park and Taksim square. However thousands still took to the streets. Large protests also occurred in Ankara, Soma, Izmir, Diyarbakir in the east and in other places. Istanbul: Riot police surrounded Soma HoldingsRiot police with water cannons was also sent to defend the offices of Soma Holdings where protesters gathered chanting “murderers”. Outside the office protesters spray painted slogans such as: "This building rises on the blood of workers" and "They didn't die beautifully [as minister of labour stated regarding a separate mine accident]. This is murder not fate". Protest near Soma HoldingIn Ankara the police fired teargas and water cannon at 800 protesters who were marching from a university to the energy ministry to protest. The protests continued throughout the day. In Soma city the mood turned from grief to anger when Erdogan reached the city. 3,500 police and gendarmes had been deployed to defend Erdogan from the angry crowd. The anger reached such a high pitch the Erdogan had to seek refuge in a supermarked (See video below) until things had cooled off. AKP offices in Soma ravagedLocals booed and whistled at him after gathering outside the Soma Municipality building where he was making a press statement. The crowd called on the government to step down calling Erdogan “Murderer” and “Thief!”. 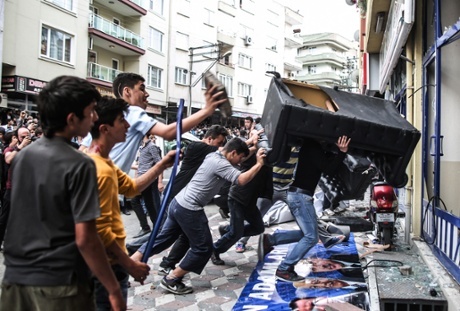 Later on, the crowd attacked and ravaged the regional offices of AKP in Soma. Erdogans advisor kicks a protester who has lost a family member in the accident.The protesters were heavily confronted and several of them were beaten up by riot police, who had gas masks and water cannons. One of the Prime Minister’s advisors and Deputy Chief of the Cabinet his office, Yusuf Yerkel, was captured on camera kicking a protester in who was being held down by riot police. Erdogan met by angry crowd in SomaThe scenes of inhabitants of Soma being beaten up during mourning by heavily armed riot police at the same time as the same armed bodies were being sent to defend the offices of Soma Holding have been on television screens across Turkey. At the same time Erdogan displays a deep contempt and disregard for the lives of the workers. All of this has raised temperatures to boiling point. Anger is simmering with the AKP government. Çetin Uygur, the former head of the miners’ union, Maden-İş, said that "the mining accident that we have seen at this private facility today is truly a work-related murder of the highest degree. We are currently facing the worst work-related murder in the country's history." Protests in IzmirTomorrow all the major trade unions have called for a general strike. In a press conference by four trade union federations that organise more than 600,000 workers, Arzu Çerkezoğlu, General Secretary of the Confederation of Revolutionary Trade Unions (DISK), announced that the four national trade union centers DISK, Confederation of Public Workers' Unions (KESK), Turkish Medical Association (TTB) and the Union of Chambers of Turkish Engineers and Architects (TMMOB) will go on a one day work stoppage following the Soma mine disaster. Arzu Çerkezoğlu, stressed that the disaster in Soma, which took [hundreds] of lives was not a natural disaster, and that what has been deemed an accident is an unconcealed mass killing. “Hundreds of our working colleagues at Soma were abandoned to their fate by being forced to work in the most merciless conditions in the pursuit of maximum profit, where workers' health and security was seen as entirely a matter of cost. Those promoting policies of privatisation and subcontracting, who cause the deaths of workers by cutting costs, those who encourage them and who exculpate previous mine disasters with their words and actions, and those who even privatise the safety supervision in the workplace with legislation, are responsible for the Soma massacre and must be held to account." “The perpetrators of this massacre are those that enact policies of privatization and subcontracts. There has been a dramatic increase in the number of workplace accidents following privatization in these fields, which had been operated publicly for years. The reason for the 40% increase in the workplace murders in coalmines between 2002-2011 is the one-third fall in the number of workers employed by the Turkish Mining Society (TTK), a state owned mining company, an outcome of privatization and subcontracting. The perpetrator of the massacre is the mentality that is unaware of the number of miners working in the field, yet announces that ‘all necessary precautions have been taken’. The leftist trade union federations have also been joined by the main trade union federation Turk-is - with more than 2 million members - which has also called for all its members to walk out tomorrow. One year ago a mass movement erupted as a small group of youth activists were being violently evicted from Gezi park for protesting against plans to build a mall. At that time we explained that the roots of the movement did not lie in that particular struggle, but in the general situation in society. In the same way the present accident is not an isolated incident. Tragically, Erdogan is right when he says that “these things happen” - especially in Turkey. It is the direct result of the ruthless hunt for profit and the wholesale privatisation of state assets. Since the AKP came to power in 2002 the Turkish economy has been booming and Turkey now has the 17th highest GDP in the world. However, this growth has been distributed very unequally. The insatiable greed of the bourgeois does not allow the smallest crumbs to reach the masses while the AKP and its cronies have been busy looting the state and politically clearing the way for the most merciless exploitation of the working class. There is a stark contradiction between the stretched hummers, private chauffeurs and obscene luxury of the gated communities in Istanbul's rich quarters and the lives in the shanty towns in the outskirts of the same city. Tragic accidents such as the one that took place yesterday involve the workers, the peasants and the poor, but never the rich. This time, however, it would seem that it may have been one too many. For years the blatant display of corruption, cronyism and obvious contempt for the working masses has been the cause of intense bitterness and pent up anger. At some point this indignation reaches a boiling point. Only a few weeks ago the AKP regime won a victory which, on paper, seemed overwhelming. However, as we explained at that time, the reason for that was not Erdogan's popularity, but the lack of a clear alternative to him. In reality Turkish society is heading towards very turbulent times. Erdogan survived the Gezi park movement, because the movement did not have a proper organisation, a leadership and a clear programme. But the price he had to pay was a significant erosion of the legitimacy of his regime and a deep political crisis, which he has so far survived. Along with his recent election victory, this has led him to lose touch with reality. That is the reason behind his complacency and his nonchalant way of dealing with this tragedy. Typical of a bourgeois philistine, he is incapable of detecting the processes beneath the surface of society where anger is simmering. A rebellion is underway which will dwarf the Gezi park uprising. The Turkish working class is the strongest working class in the region. Once it rises shockwaves will move throughout the world. The tragic death of the miners yesterday was not an accident. It was caused directly by the rule of the bourgeois in Turkey. The only way to avenge these deaths is to forcibly remove this class of parasites and uproot their whole system. The Turkish workers must use the day of action tomorrow as a first step towards an open ended general strike to bring down the Erdogan government and sweep away his network of cronies and businesspeople. Avenge the death of the Miners! Prepare an all-out general strike to bring down the AKP government! Down with Erdogan and with the rule of murderers and thieves! Justice for the Miners! Arrest all those responsible - from the politicians to the businesspeople! Re-nationalise all privatised companies and all companies connected with the AKP! Nationalise all companies which do not follow proper security procedures!